Google Analytics is a system that tracks your website visitors and their activity on your website. It also monitors well as where users they have come from and how they found your website, along with many other notable features. While the product is aimed chiefly at marketers as opposed to webmasters, having this service implemented into your website can provide you with incredibly valuable insights that you would have never have had access to previously. Understanding which marketing tactics are the most effective. View accurate website traffic patterns and trends. See a detailed look at where visitors are coming from, be it country or referred website. Able to make strategic initiatives based on hard data. Understanding what visitors do once they go to your website. Which pages visitors stay on the longest. How to get people to stay on your site for longer. This is only scratching the surface of what Google Analytics has to offer and why it should be used, however it can answer a lot of questions that were not previously known using simple traffic counters. You can use Google Analytics on social media buttons, so that businesses can track their traffic from sites such as Facebook. 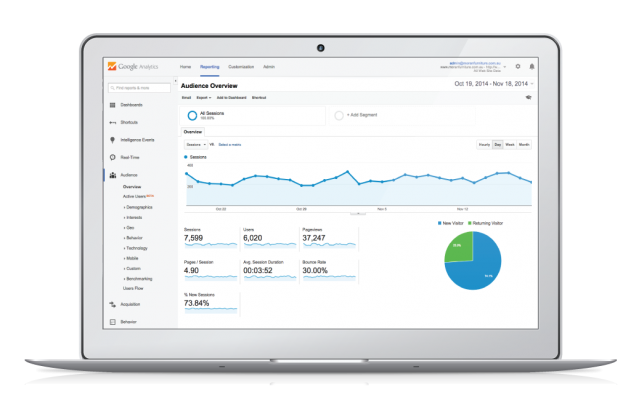 Another aspect of Google Analytics is using it in conjunction with AdWords. Furthermore, the data that is collected from AdWords can be imported simultaneously into Google Analytics, making tracking simple. Not only does Google Analytics have fantastic traffic software, it also plays a great role in E-commerce tracking, such as figuring out when customers leave your website during the check out process (Goals) and what products they navigate to. One can also find out what related products customers have chosen. Tracking mobile apps is also possible with Google Analytics. Find out how many customers have downloaded your apps, where they are from, and how they found you! You can set up automated reports on Google Analytics. You’ll never have to worry about setting up reports every week, month or quarter. Have them e-mailed directly to you at your discretion. All in all, Google Analytics is a very powerful, and free tool, that is vital for businesses today.